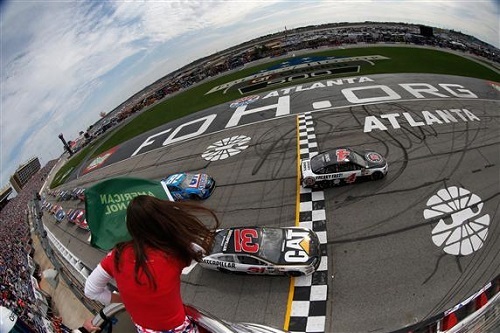 The Monster Energy NASCAR Cup Series takes the green flag for the Folds of Honor QuikTrip 500 at Atlanta Motor Speedway on March 5, 2017 (photo courtesy of Getty Images for NASCAR). Atlanta Motor Speedway track officials were set to have their track repaved after Sunday’s Folds of Honor QuikTrip 500 Monster Energy NASCAR Cup Series race. But urging for several drivers have those same track officials rethinking their plans. Speedway Motorsports Inc. is the parent company of Atlanta Motor Speedway. Dale Earnhardt Jr. is among the drivers who have publicly asked for a delay. “Well if we ask @MarcusSMI nicely, maybe he will put off paving it for another year or two,” Earnhardt (@DaleJr) tweeted. AMS was last paved in 1997 and its current surface is one of the oldest on the Cup Series schedule. Drivers, generally, prefer the “character” of older racing surfaces. On freshly-paved, smooth tracks, cars get more grip and are, generally, easier to drive. Recent repaves, though, including one at Kentucky Speedway in Sparta, has included efforts to give surfaces back some of that character, as opposed to a typical new asphalt finish, through different aggregates and grinding. According to Smith, whenever Atlanta is repaved, decisions relating to aggregates and methods used will be based on the repave scheduled at Texas Motor Speedway, another SMI track, in Fort Worth. TMS also is scheduled for a repave this year. Atlanta Motor Speedway hosts all three national divisions of NASCAR once yearly, during a tripleheader weekend early in the season.